When your marriage falls apart, the last place you'd want your husband to move to is downstairs. Unfortunately for Sarah, up in the eaves at number 24, her ex-husband now lives one floor beneath her with his new wife. Their happiness floats up through the floorboards, taunting her. The Spring brings a new couple to the house. Jane and Tom's zest for life revives the flagging spirits, and Sarah can't deny the instant attraction to handsome Tom. Having seen at first hand what infidelity does to people, she'll never act on it ... but the air fizzes with potential. The sunshine doesn't reach every corner of number 24, however. Elderly Mavis, tucked away in the basement, has kept the world at bay for decades. She's about to find out that she can't hide forever. Review: Oh my goodness, everything that could possibly happen inside Number 24 literally does happen. This is a book packed full of twist, turns and dramatic revelations and that made for some fast-paced, Page-turning reading for the entirety of the second half! 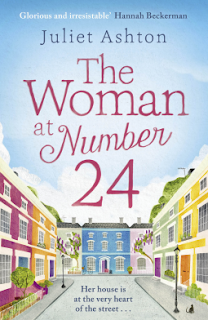 Number 24 is a house split into flats in Notting Hill and each of the residents, or former residents in these flats each have their own dramatic story lines going on but Sarah, who lives in the flat at the top of the building and is the titular woman, is the lynch pin that holds it altogether. So whilst there are so many dramatic story lines taking place, this is a very character driven book, I loved that about it. The novel begins fairly pacey because we are working out who all the residents are and how they relate to one another. each chapter begins with a quote from the calendar from the Chinese takeaway that Sarah uses and is a piece of wisdom that someone in that chapter could definitely use. I loved the little clues that Juliet Ashton left in the form of the wise sayings and other little clues about people throughout the chapters, and just like her last book, i enjoyed working out what everyone's story was and the skeletons in their closet. It is fairly hard to pass judgement on many of the characters in this novel because there are so many twists and turns and everyone is not who they seem to be. I loved the relationship that the characters had and developed with one another though. Many people in London do not know their neighbours and this book certainly starts of being that typical set up, with only a couple of exceptions. There are many changes over the course of the book, but I liked seeing how the characters and those changes affected relationships within the doors of Number 24. Sarah is a great character to hold the whole story, and the house, together because she is very relatable. She is recently divorced but having to see her husband on a regular basis. Because of the housing situation, in cities in particular, many people are faced with this situation The crisis of her sudden divorce has also made her question her professional capabilities and so we have to go through that with her as well, making her even more easy to sympathise with as a character. She is just a normal woman who is determined to make the best of herself but questions her choices at every turn. I loved the friendships that she forged during this novel and I loved watching her grow and change as a person over the period of time that this story is set. The beginning and end of this book (I'd say the first 30% and the final 40%) are very pacey and I read those sections all at once. I couldn't believe some of the twists that this story took on and found myself shouting at the characters to realise what was going on right in front of their eyes. The very middle of the book dragged a little for me, it was focused on one storyline in particular and I just didn't click with that one. Overall though this was a great read and in keeping with what I have now come to expect from this author. This would be a great book to read over the bank holiday weekends that are coming up and if you haven't read any of Juliet's other novels, definitely add those to your TBR too!